If you’re like me, you love photos of your friends and family around you. If you’re like my husband, you complain that you can’t move around the house for fear of knocking over row after row of framed photos like so many dominoes. Compromise! Practicality wins out, except during the month of December. 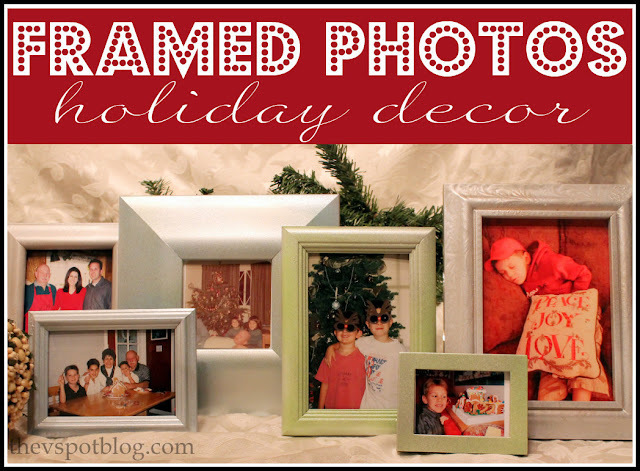 I bring out a TON of framed photos at Christmas time and incorporate them into our holiday decor. 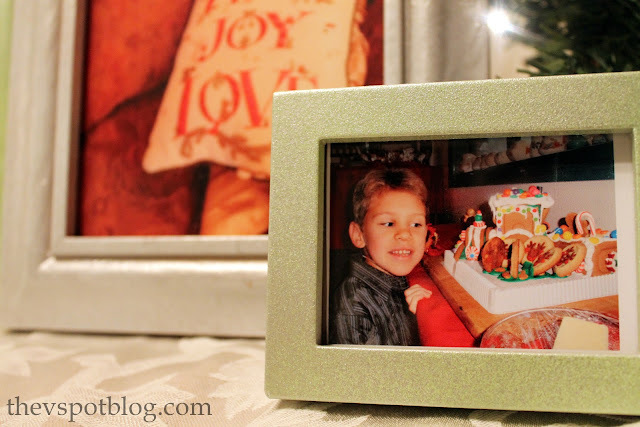 I gathered favorite photos from Christmases gone by, framed them, and each year display them. As long as the frames are color coordinated with your holiday decor, it just adds another layer of festivity to your home. This is so easy. I even store the photos in their frames. I just toss them in a bin with other holiday items. 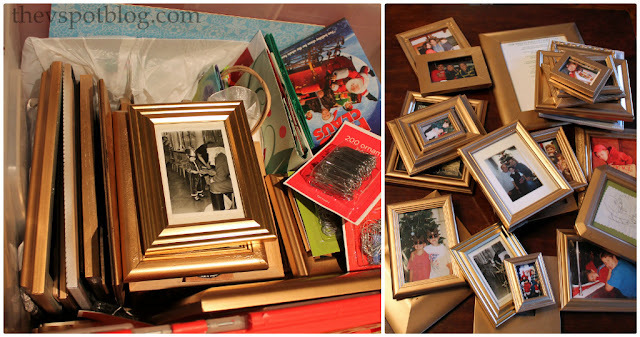 When dry, pop the photos back into the frames and start tucking them around the house. 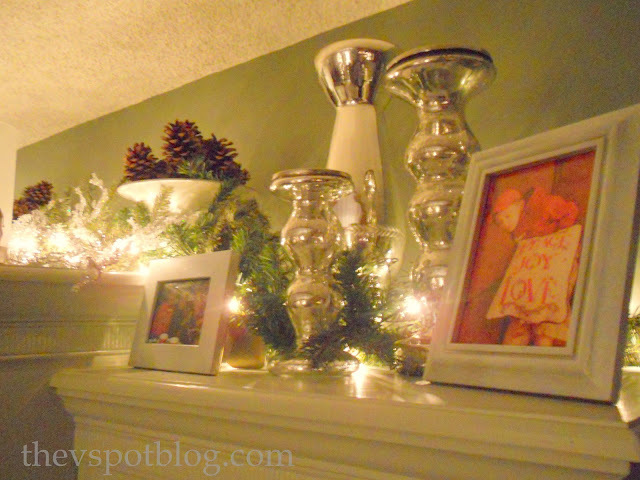 I put them on shelves, in window sills, in the bathroom, on the mantel… I have even shoved a couple of the smaller ones in the tree! It is so much fun to see them each year. We have the framed photos, but also precious pieces of art work and favorite cards. I love this photo of Grant. He and my mom had made this gingerbread train together, and she was trying so hard to get him to pose next to it, but he was so enamored of his creation that he couldn’t take his eyes off of it. Priceless! It’s really not much fuss to take cheap frames and just keep painting them. It keeps your Christmas photos neatly stored in bins each year, and each time you unpack them, it’s like a little gift just to see them and smile. Do you decorate with photos? Click here to see the Halloween photo garland that I made. You could easily make one for Christmas. I did that when my husband was in the military it was a great way to keep our family all around us when we were far from home. This is such an amazing idea, and one I might actually do! I’m terrible at decorating seasonally. I always want to but never find the time. I have been telling MacGyver I want to get seasonal art pieces, and this is even better. 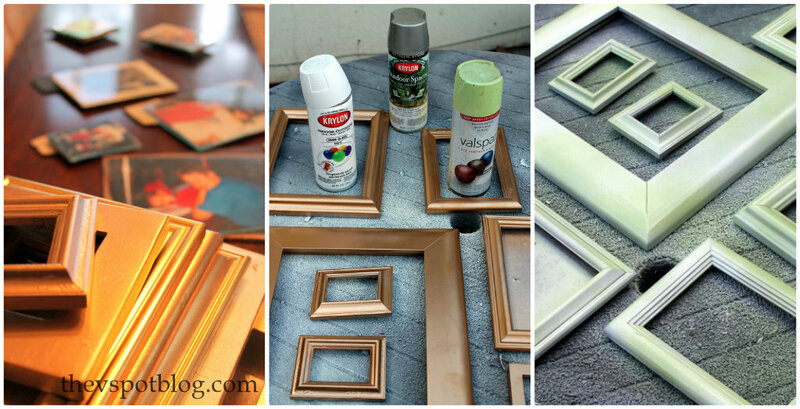 I love that you can change things so drastically just by spray painting a frame. Gracias por tu blog, muy emocionante.